Customizing your interior or getting it back to factory standards has never been easier. These replacement Center Consoles are for the 1967 Chevy Camaro Coupe models. Manufactured to factory specifications and workmanship. Center Consoles use quality, durable material to make the interior look new and stand up to the elements. Period specific colors, vinyl material and patterns are used in most cases. Chevy Camaro Standard Center Console - TMI's new center consoles can be installed on a car with or without a stock console. Note: Console will fit lower on cars without Factory Consoles. This Console fits in between your two front bucket seats has two standard size cup holders. Consoles are manufactured with a French Seam, Hidden Hinge, and a Secret Lower Compartment! Dimensions: Length: 18.5" , Width at rear: 6.5" , Width at front: 9" , Height at highest point:9.5"
These will come in 2 styles. All one color, or in 2 colors, with the insert under the arm rest pad being the second color. The Madrid grain Vinyl is the same as the original and all colors are factory correct for the year. 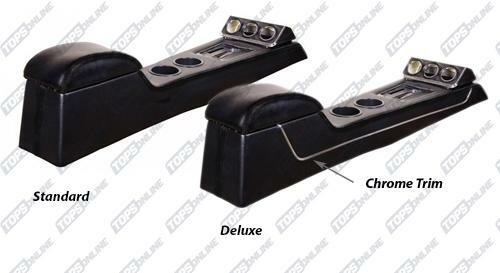 Chevy Camaro Deluxe Center Console - TMI's new center consoles can be installed on a car with or without a stock console. Note: Console will fit lower on cars without Factory Consoles. Consoles are designed to fit between the 2 front bucket seats, are manufactured with a French Seam, Hidden Hinge, and a Secret Lower Compartment! These will come in 2 styles. All one color, or in 2 colors, with the insert under the arm rest pad being the second color. Both styles feature the chrome trim. The Madrid grain Vinyl is the same as the original and all colors are factory correct for the year. Take your Camaro's interior to the next level! Standard or Deluxe Sport full-length consoles. Your choice of original vinyl colors. Made by TMI in the United States. Full length Standard consoles have two cup holders and a Hidden hinge. Full length Deluxe consoles have two cup holders, a Hidden hinge and chrome trim. Both Consoles are an exact reproduction of the original pattern. The material colors and grains are correct for the year. They Utilize factory attachment methods, giving you a show quality fit and finish. The Instrument Cluster and Shift Plate are not included. They Must be reused from the original or purchased new. Take your Camaro's interior to the next level! Sport R and XR Full Length Consoles, Made by TMI in the United States. Full length consoles have two cup holders, Chrome trim and a hidden hinge. Full Length Sport R Consoles use premium vinyl with unisuede inserts, chrome trim and contrast French-seam stitching available in many colors for a unique look. Full Length Sport XR Consoles use premium vinyl with unisuede inserts, chrome trim and contrast French-seam stitching available in many colors for a unique look. In addition, They are accented with Satin Black or Stainless Steel Grommets and the contrast color of the stitching will show through the Grommet. 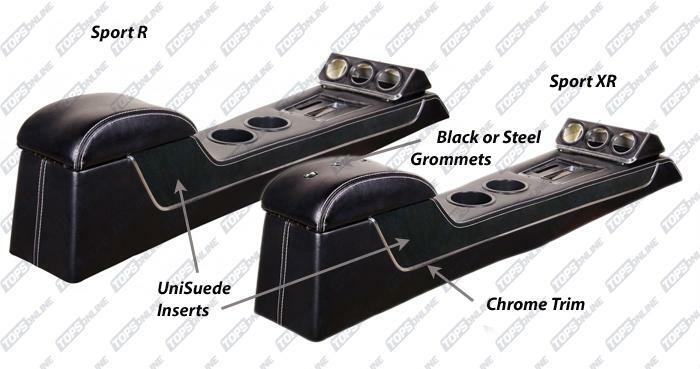 Sport XR Center Consoles are also available with Brass Grommets, please inquire. Sport R and XR consoles match TMI's Sport R and XR upholstery, Door panels, Quarter Panels and one-piece unisuede headliners.